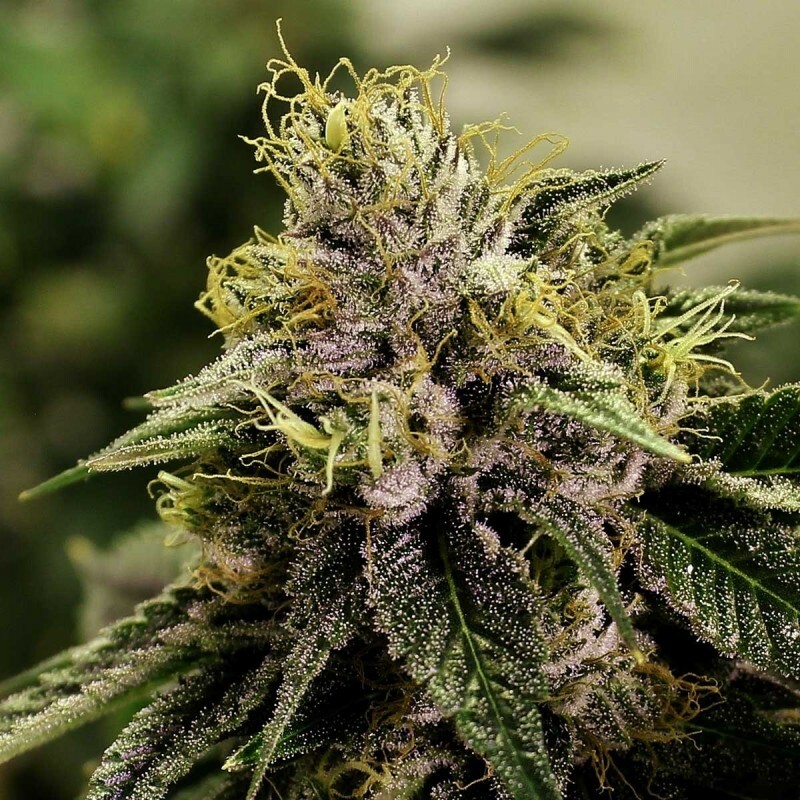 Blue Mystic feminized cannabis seeds, nothing but love from those who tried it, the combination of sweet taste and great effect shoots this one right into the top 10 of popular kinds. Blue mystic is mostly Indica dominant with all it's powerful characteristics, as far as we know its origin lies in California, America. This Indica queen doesn't grow very tall but has the tendency to grow bushy producing wide growing blue colored trichome covered buds. By pinching the head top the plant creates more branches what means the yield will increase, giving you more buds ! In it's growing phase the smell is hardley noticable but as soon as you smoke the properly dried buds the sweet berry-like taste will surprise you. Consuming Blue Mystic at first provides an energetic high that flows into a good stonedness keeping you in a head-lock for a while. Blue Mystic feminized seeds are known for their soft blue hues that look roughly halfway into flowering. This strain shares most of its qualities with famous Northern Light. It has all the desirable qualities of a perfect cannabis strain along with the added appeal of colorful, beautiful appearance. Unlike many other cannabis seeds, it maintains neutral smell from seedling to rising period. It has nearly berry-like taste after smoking. It’s the feminized version of the original Blue Mystic, and this indoor strain has its origin in California. It produces heavy buds and under good cultivating conditions, these buds usually have shiny blue shade in the final stages of flowering. It has smooth, fruity-berry flavor and comparatively high quality shelf life. Blue mystic feminized seeds are basically from Oregon and California, North America. The hybrid seeds are from the lineage of two well known Indica breeds namely Blueberry and Northern Lights. The quick growing and high yield producing features of the feminized seeds has made them one of the best suggested plant strains for the beginners. The complete plant cycle from the seed sprouting into seedlings till the bud formation requires about minimum of 3 months and flowering takes about 8 to 9 weeks for complete maturation. If you find that your seeds are taking more time for maturing, then you could visit this seedbank and discuss with experts. No matter whether you are a fresher for the weed cultivation or have few years of experience, contacting High Supplies cannabis seed banks is the best way to ensure that you are dealing with one of the global authentic seed banks. If you are willing to learn more about any seed cultivation then the customer care for the seed banks are always happy to help and answer the queries of the customers. Blue Mystic has a tasty fruity flavor and anti-anxiety properties make it one of the best strains for both recreational and medicinal use. The hybrid of popular breeds, Blueberry and Northern Light, it has high yield, best flavor, and heavy high. One of the best qualities of Blue Mystic feminized seeds is its fast growth rate. The whole seedling to flowering and maturity period is less than three months. It grows into average height (75-125cm) and the yield volume can be easily enhanced by improving horizontal bushing with spreading and trimming. It can be grown both indoors and outdoors, but the quality of buds and best results can be attained when cultivated outdoors, if you live in areas nearby Northern European region. this has been the best medi- strain i have ever tride. sow now i hawe a girl scout in the grow rom. I can almost not waite. nice plant. it gives you a ... WHAT.. when its a week left. gooooodddd. 4 Tage nach Überweisung war der Brief im Briefkasten. So nun zu den Seeds. Gekeimt nach unglaublichen 9 Stunden!! Nach 14/16 Stunden konnte ich sie in jiffes einsetzen. Gekeimt wurden sie in einer tupperware Schüssel mit ziemlich feuchten zewa Tüchern im Schrank bei 22 grad. Bis jetzt läuft alles prima! Bin sehr zuversichtlich dass diese pflanzen was werden, da die keimzeit so kurz war kann man fast glauben das sie erst am Vortag von der mutterpflanze gefallen sind! 1 A Qualität! Ich bin sehr beeindruckt! Sobald sie gedeihen melde ich mich hier wieder. Can you get them in less than 5 seeds ? ?